If you build your own PCs, you’ve probably considered parts from Corsair. They sell well-liked memory, cases, power supplies, coolers, SSDs, even peripherals these days. Now they’re introducing their own do-it-yourself living room gaming PC. And gosh is it big and ugly! Yeah, I’m not quite sure why Corsair decided that this computer would be right for your living room. (I don’t think it’d even fit on my home entertainment center’s shelves.) But if you’re looking to build an incredibly powerful gaming PC in a relatively small case, I could see the Bulldog being a good start. For $400, you’ll get an extremely rugged chassis, a high-end Intel Z-series motherboard, a CPU liquid cooler, and a completely modular 600W mini PSU. Which means you’ll still need to add your own CPU, GPU, memory, storage, and operating system, but the Bulldog should handle them all in stride: it’s got room for 32GB of memory, up to three storage drives, and the biggest graphics card you can buy. And—most of all—lots of cooling to keep those components quiet. Not only did Corsair come up with this new small-form-factor CPU liquid cooler, but you can buy a liquid cooler for the GPU for an extra $100. The included 600W power supply, also a custom design, has a 92mm fan that’s abnormally large (and thus quiet) for a power supply this size. 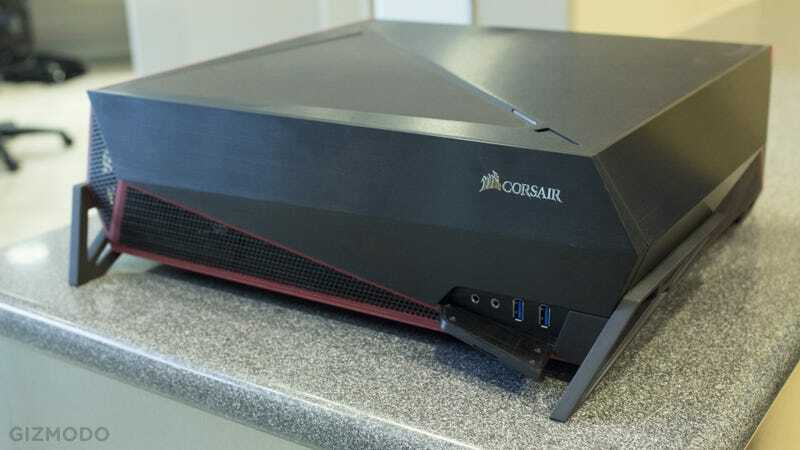 Corsair showed me a Bulldog running full bore with a Core i7-4790K and a GeForce Titan X—both modestly overclocked—and I was hard pressed to tell. I could barely hear the fan noise from across a small room. Corsair’s also introducing the Lapdog, a mouse and keyboard tray designed for use from the couch. For $89, it’s got a built-in 7” x 11” mouse mat, a mouse bungee, USB hub, and a detachable memory foam base for comfort. It’s wired, with a 16-foot USB cable that you’ll need to avoid tripping over. Keyboard and mouse not included. The Bulldog should be available at or around October, and the Lapdog’s coming later in Q4. If you just want the new PSU or one of the liquid coolers, Corsair will offer those seperately, too.